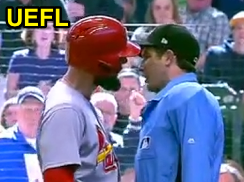 HP Umpire John Tumpane ejected Cardinals 1B Matt Carpenter and Manager Mike Matheny (strike two call) in the top of the 7th inning of the Cardinals-Brewers game. With two out and none on, Carpenter took 3-1 and 3-2 sliders from Brewers pitcher Brent Suter for called second and third strikes. Replays indicate the 3-1 pitch was located over the inner half of home plate and at the midpoint (px .640, pz 3.610 [sz_top 3.49 / MOE 3.57]), the call was incorrect. * At the time of the ejection, the Cardinals were leading, 4-2. The Cardinals ultimately won the contest, 6-4. This is John Tumpane (74)'s first, second ejection of the 2017 MLB regular season. John Tumpane now has -6 points in the UEFL Standings (-2 Previous + 2*[2 MLB - 4 Incorrect] = -6). Crew Chief Ted Barrett now has 0 points in Crew Division (0 Previous + 0 Incorrect Call = 0). *Strike two call (x-1 count) satisfies contributory pitch QOC criteria under UEFL Rule 6-5-c-5-a. This is the 14th, 15th ejection report of 2017. This is the 6th player ejection of 2017. Prior to ejection, Carpenter was 0-3 (3 SO) in the contest. This is St. Louis' 1st/2nd ejection of 2017, 1st in the NL Central (STL 2; CHC, CIN, MIL, PIT 0). This is Matt Carpenter's first ejection since August 22, 2015 (Chris Segal; QOC = N [Balls/Strikes]). This is Mike Matheny's first ejection since June 30, 2016 (Mike Everitt; QOC = Y [Replay Review]). This is John Tumpane's first ejection since May 20, 2016 (Hector Santiago; QOC = Y [Balls/Strikes]). Wrap: St Louis Cardinals vs. Milwaukee Brewers, 4/23/17 | Video via "Read More"